Pearl cotton threads come in a variety of sizes suitable for hand embroidery. Some, like Size 12, are fine and useful for small details like the stems and leaves making the flowers above. Other pearl cottons, like Size 3, are hefty. See the bold yellow threads? Difficult for a lot of hand stitching, Size 3 pearl cotton is perfect for Couching. Couching is a method of securing thick threads onto fabric with finer threads like a Size 8 or 12. In the Love at First Stitch project from Joyful Stitching, Size 3 threads are couched to make the ground for the garden plots. 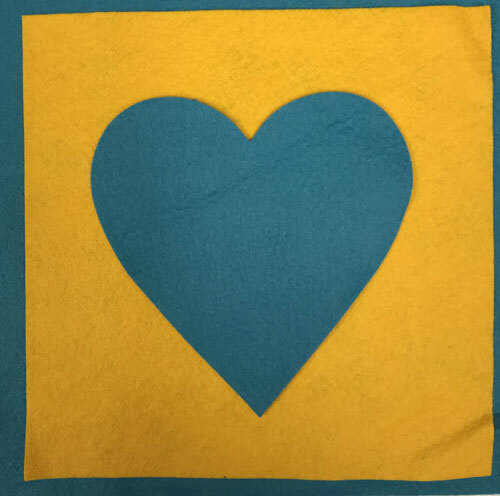 A Size 3 also slides under the tines of Blanket Stitches to add a heavy border to the heart shape. Want a bold line on your design? Use Size 3. And the lucky winner of the felt fabrics to make her own Love at First Stitch project is Jean E.
Congratulations! I’ll contact you soon. 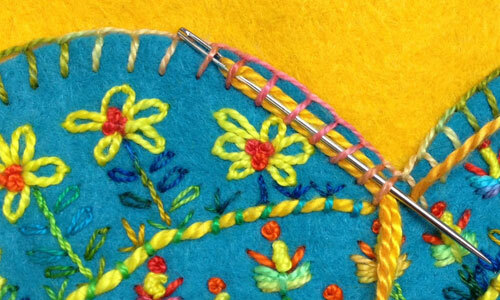 Read more about the projects in Joyful Stitching here. 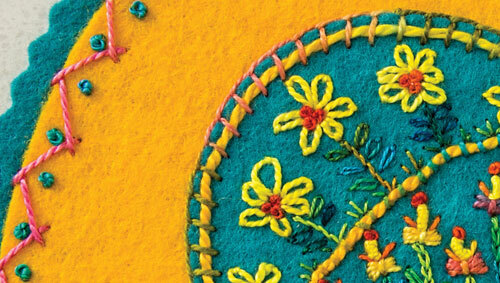 This entry was posted in embroidery, Joyful Stitching book, stitching, thread by Laura. Bookmark the permalink.